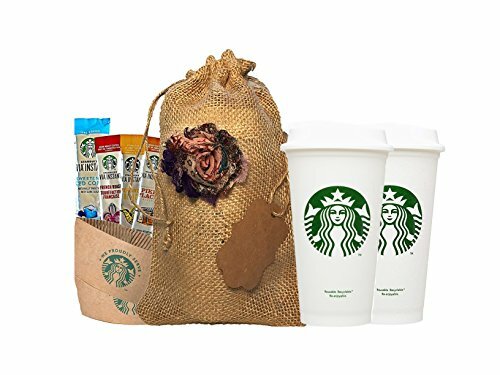 PERFECT GIFT FOR ANYONE: not only for Mother's Day but also for Starbucks birthday gifts, for get well soon care package, best girlfriend, teacher appreciation gifts, and for any occasion you want to treat your special coffee lover with an eco-friendly gift. STARBUCKS VIA INSTANT COFFEE: Sampler pack is made only with high-quality arabica coffee beans. No coffee machine or grinder needed. Just tear open a packet of Starbucks VIA Instant Coffee in the reusable cup, add hot water, wait 10 seconds and stir. Create great-tasting beverages with these single-serve, ready-to-brew packets. Enjoy them anytime, anywhere-in an instant. BPA FREE, MICROWAVE AND DISHWASHER SAFE: The plastic Starbucks travel mugs are BPA free, include tightly fitting spill-proof lids. The reusable coffee cups are dishwasher and microwave safe but remove lid first.